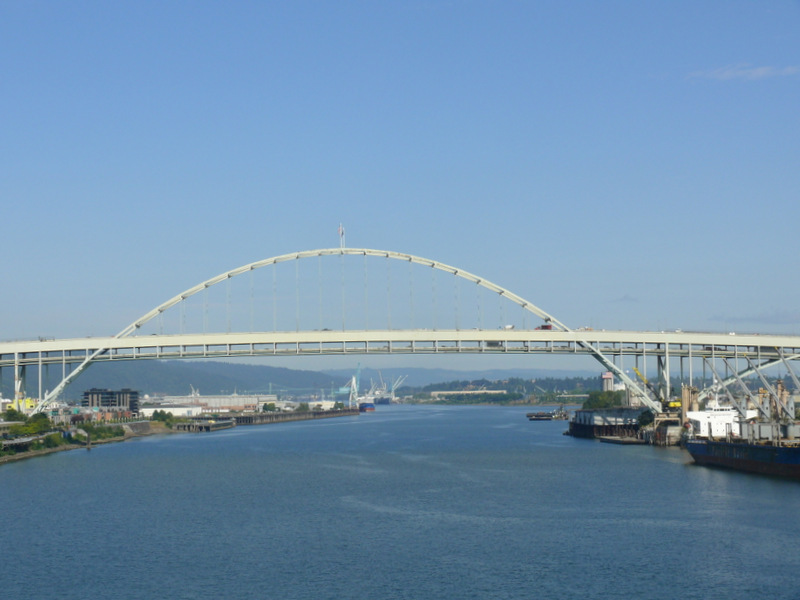 In August of 2014 i crossed off a bucket-list item by driving to Portland and photographing its bridges from my Segway, adding a handful of posts to my blog while i was there. 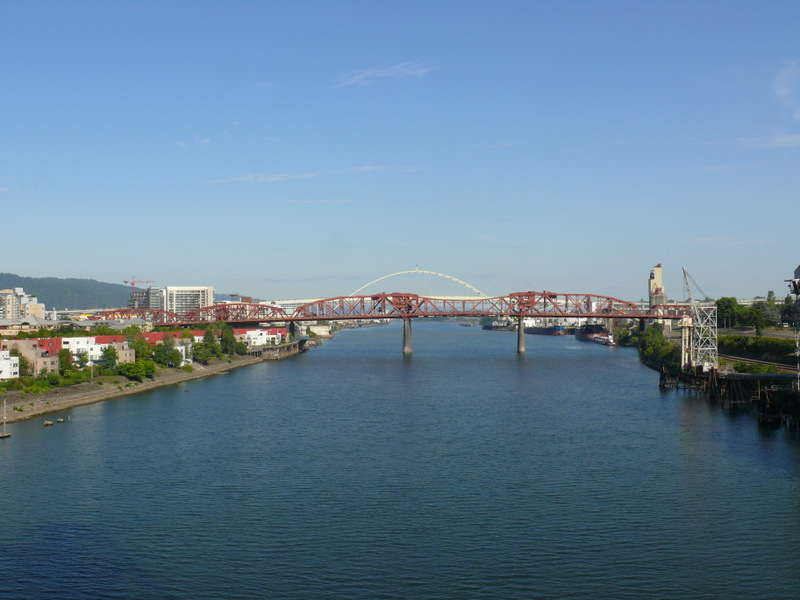 But of course i couldn’t do justice to the bridges that way, so the solution was to focus those posts on the details of the trip and my adventures in wonderful Portland while creating this separate menu item for a photo essay on its bridges. I thought about calling this effort “The Bridges of Multnomah County” but scrapped that title because i felt the allusion would be a bit of a stretch for most people since who the hell knows the name of the county Portland’s in. 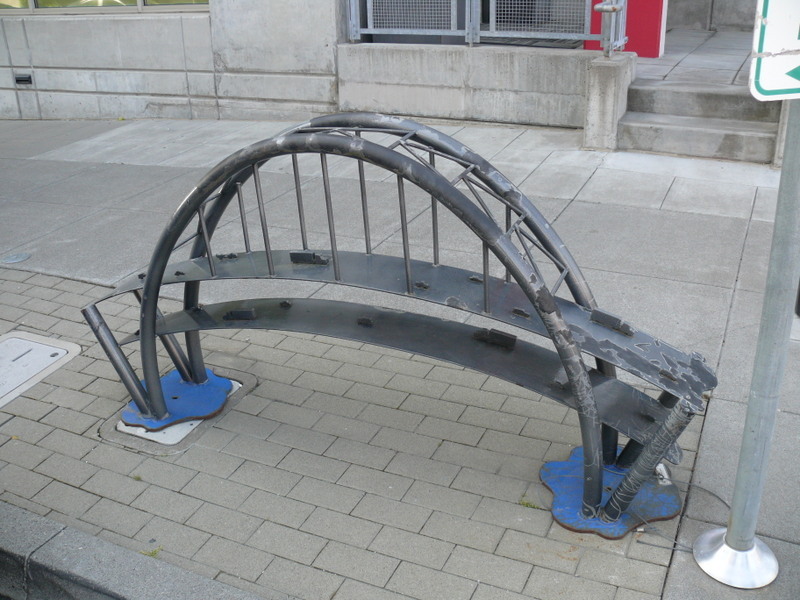 To get off to a properly whimsical start, here’s some rich Portland humor, or art, a bike rack in the form of a mini-sculpture of their Fremont Bridge. Let’s start at the south. I’m ignoring the I-5 Boone Bridge over the Willamette at Wilsonville about ten miles south of greater Portland even though it is distinguished by very handsome sculptures at either end, neither of which as best i can tell is at all photographable except from a helicopter owing to an absence of turnouts at the ends of the bridge. Or at least until i’ve taken over and can have the governor stop traffic on the bridge for me. 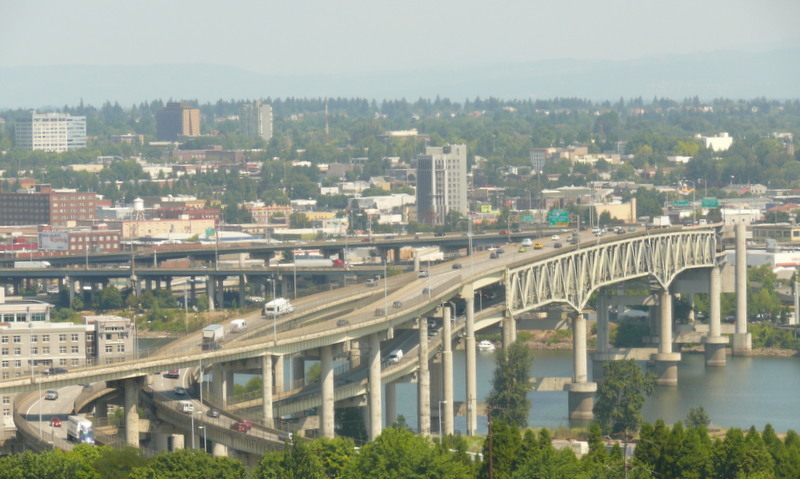 At the bottom of my Portland map, which extends to the southernmost satellite cities, there are two bridges over the Willamette between the suburbs of Oregon City and West Linn, the southernmost of which is the Oregon City Bridge and just a mile north of it, the George Abernethy Bridge carrying I-205. 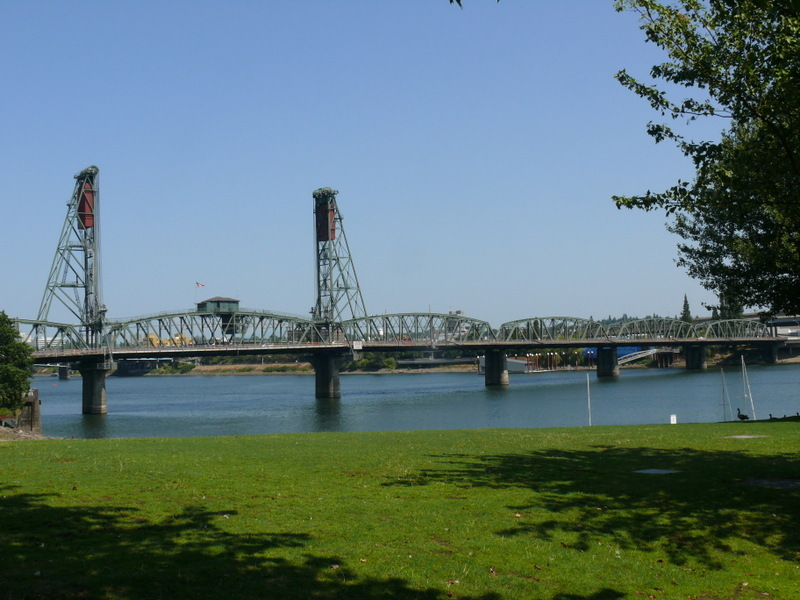 Five miles north of that is the Lake Oswego Railroad Bridge between the towns of Lake Oswego and Milwaukie. I am considering all these bridges outside my scope. Gotta stop somewhere. 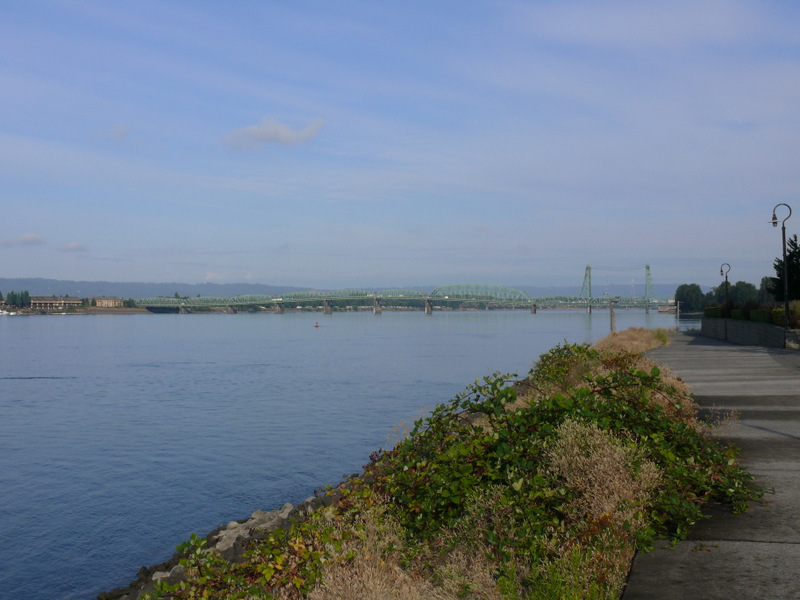 Which finally brings me to the 1925 Sellwood Bridge, three and a half miles farther north. This is not an easy bridge to photograph, partly owing to the the absence of footpaths along this part of the river and also because it’s being replaced and has been shifted off the original supports during construction of the replacement, which is only just starting. Well, see, several years ago those fretful engineers took a look at the cracks that were developing and panicked, banning all larger vehicles and frightening away the cars driven by sissies. But here it is from the north. 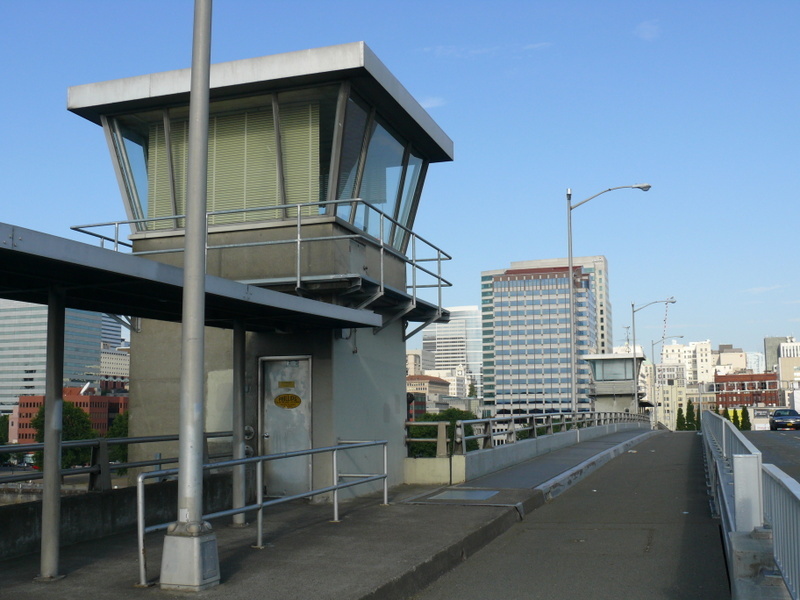 There’s a sidewalk only on the north side of the bridge, and the description of it in the above link does not exaggerate its narrowness. Those leaves you see to the right of the Segway’s right wheel below are in the roadway, off the edge of the raised pedestrian pathway shared by bikes going in both directions. The concrete post you see to the left side is one supporting the railing and they leave barely more than two feet for the pathway. That black rectangle is the shadow cast by a vehicle moving past my elbow. Yikes! And of course i rode across and back. 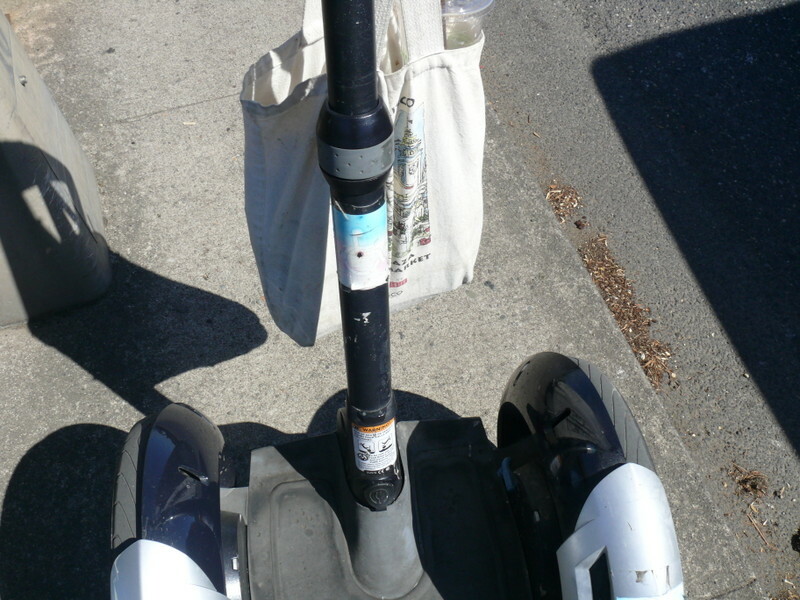 Luckily, the weight of me and my Segway turned out not to be the fatal straw. And yes, i did meet some bicycles on the return trip, but by turning the Segway sideways and pushing it up against the rail in between the railing support posts, i left the bikers almost two full feet of clearance, for which they expressed their appreciation. Well, except for the one who was texting. 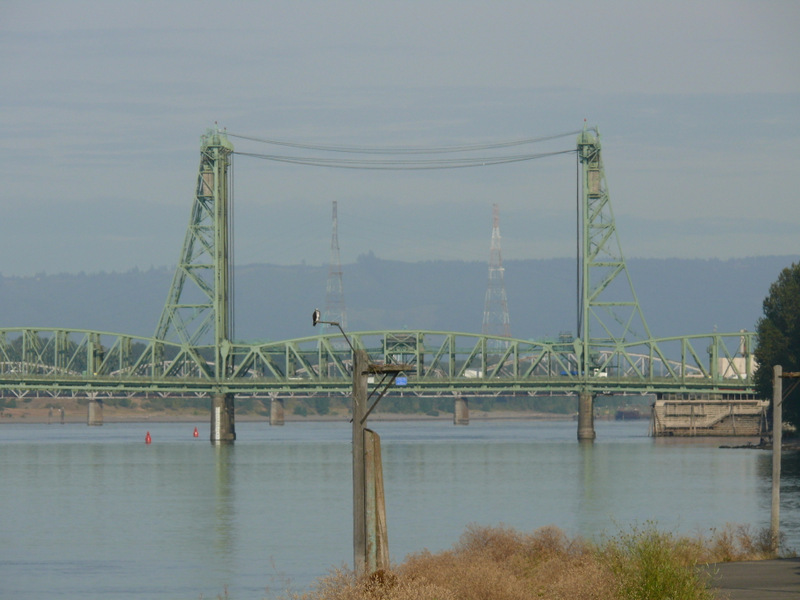 Next, dating from 1926, the Ross Island Bridge, two and a half miles north of the Sellwood Bridge. It’s so damn long that i couldn’t find a vantage from which i could get a good shot of the whole thing. Here’s the part that’s over the water, taken from the Portland Aerial Tramway. And from the west bank of the river. 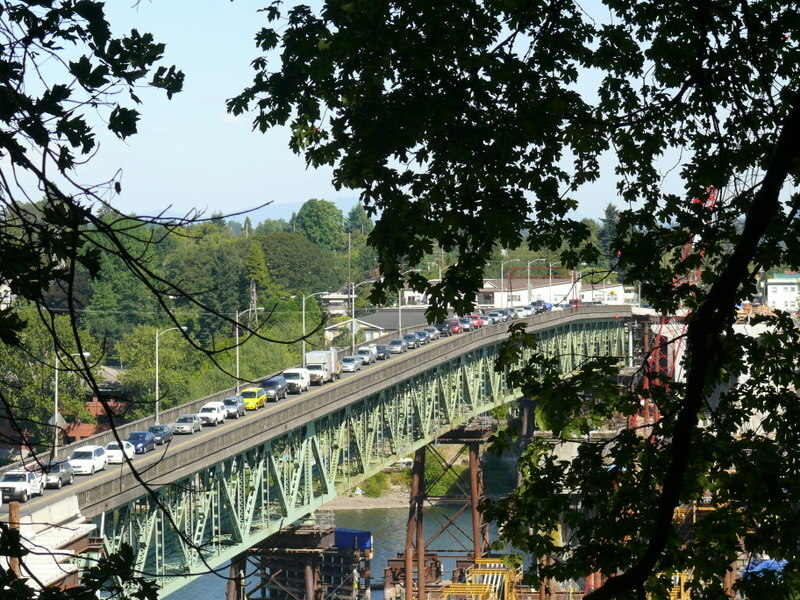 Like the pedestrian/bike path over the Sellwood bridge, the one on this bridge is on the north side only, but even though it’s a full foot wider than that over the Sellwood bridge, it’s way scarier owing to the traffic traveling so much faster. I described my ride over this bridge in The Rudest Bridge. 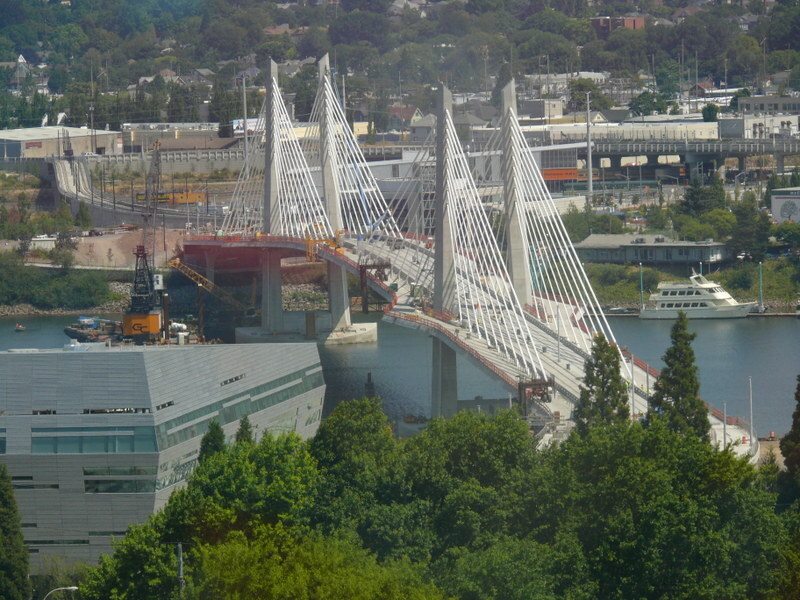 Now we’re in a very thicket of bridges, the next bridge up being the Tilikum Crossing, a mere quarter mile to the north. It’s for pedestrians, cyclists, streetcars, buses, and emergency vehicles, but not for private motor vehicles, not even for entitled SUV’s. It’s not scheduled to open until 2015, but it looks pretty much complete now, and i learned from locals that if i’d only waited two weeks to make this expedition, i’d have been here for a brief preliminary opening of the bridge for pedestrians and cyclists only. Aaarghh! Oh well, here it is from the Portland Aerial Tramway. From the waterfront behind that splendid OHSU building in the above pic, with an interesting sculpture in the foreground. And here’s an excellent time-lapse video of its construction. Here it is from the Ross Island Bridge. 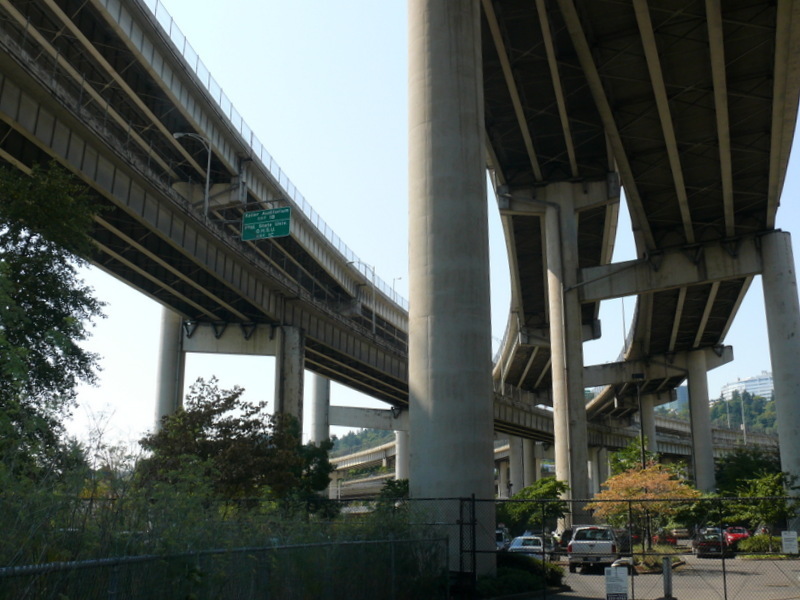 And from under the Marquam Bridge. 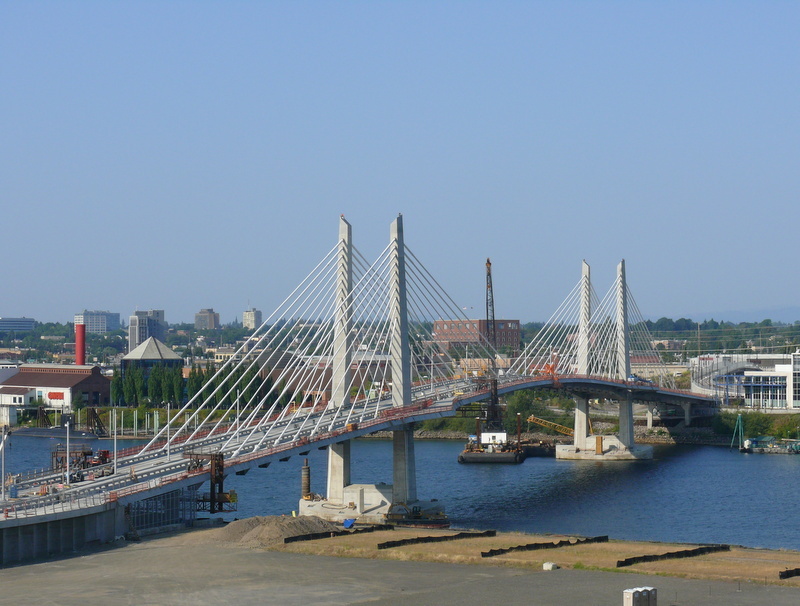 Just a quarter mile north of Tilikum Crossing is the Marquam Bridge, completed in 1966 and seen just above framing the Tilikum Crossing. This double deck monster carries four lanes of I-5, and i suppose it’s hard to be beautiful when you’re performing such heavy labor. 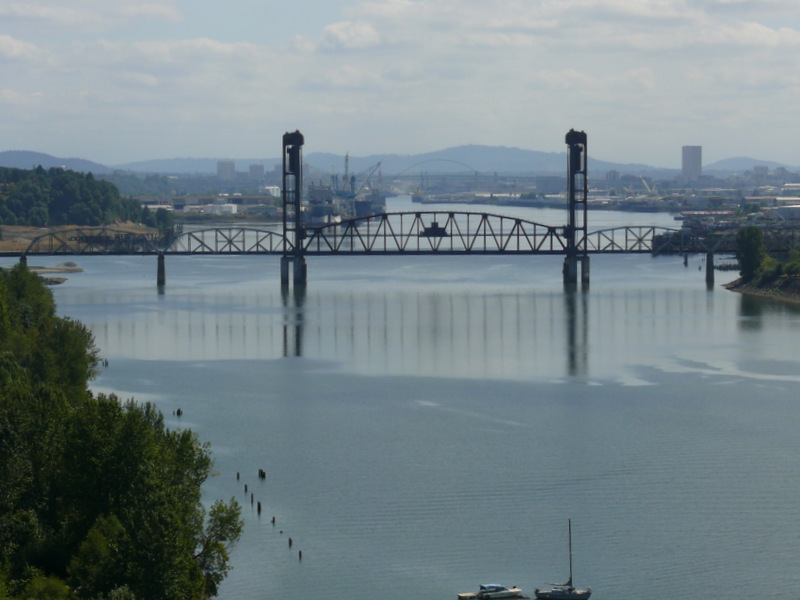 Still, of all Portland’s bridges, it is clearly the least beloved of the locals owing to its blocking views from downtown and general lack of loveliness. And from the Portland Aerial Tram. Actually, like some people, it looks best when only parts of it are photographed. Here’s the naughty bits. Now we’re starting to get into the good stuff, the drawbridges. 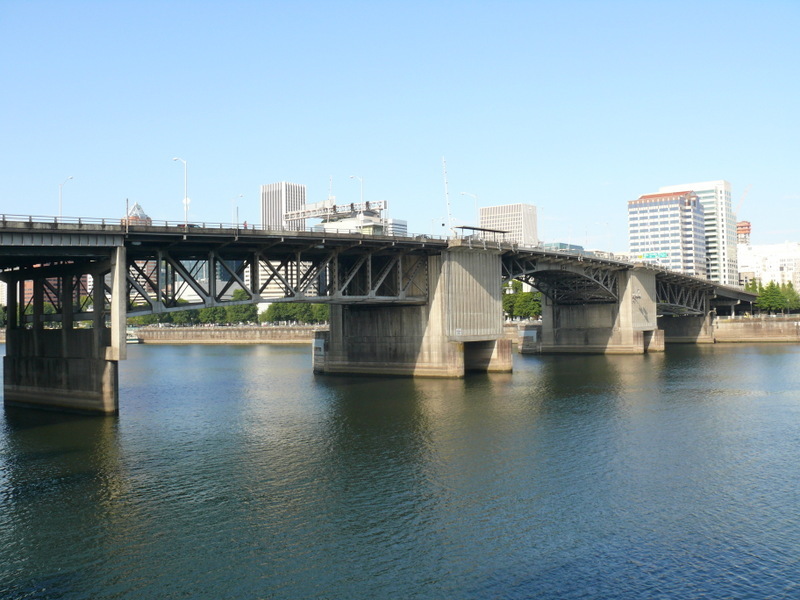 All the previous bridges discussed here are fixed spans, but the next five are drawbridges. 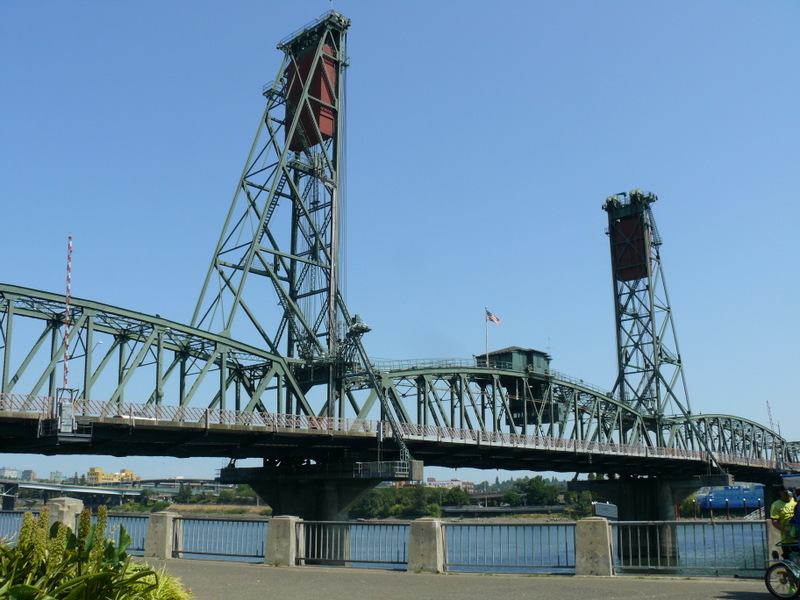 Just four-tenths of a mile north of the Marquam Bridge is the Hawthorne Bridge, built in 1910, the oldest operating vertical lift bridge in this country, and a very handsome bridge it is. 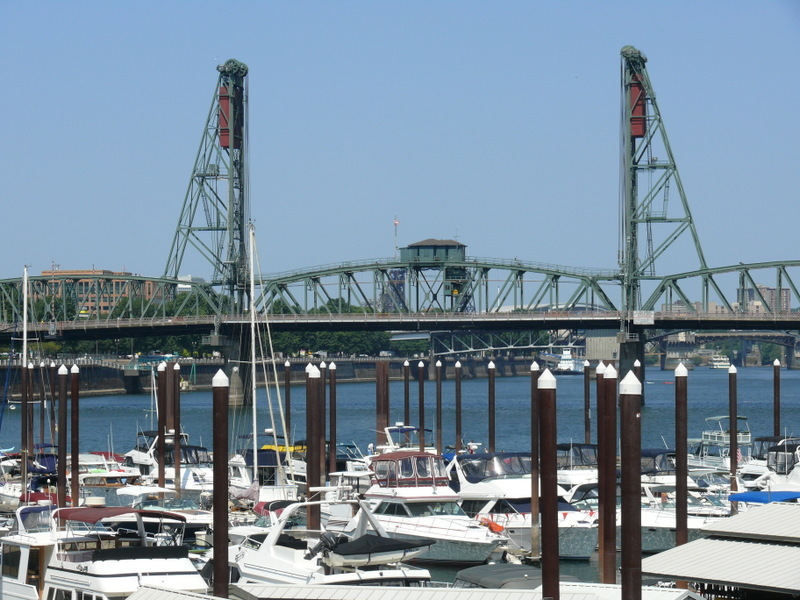 The lift portion of a drawbridge is called a bascule, and here’s the Hawthorne Bridge bascule and lift towers shot from a marina on the western bank. 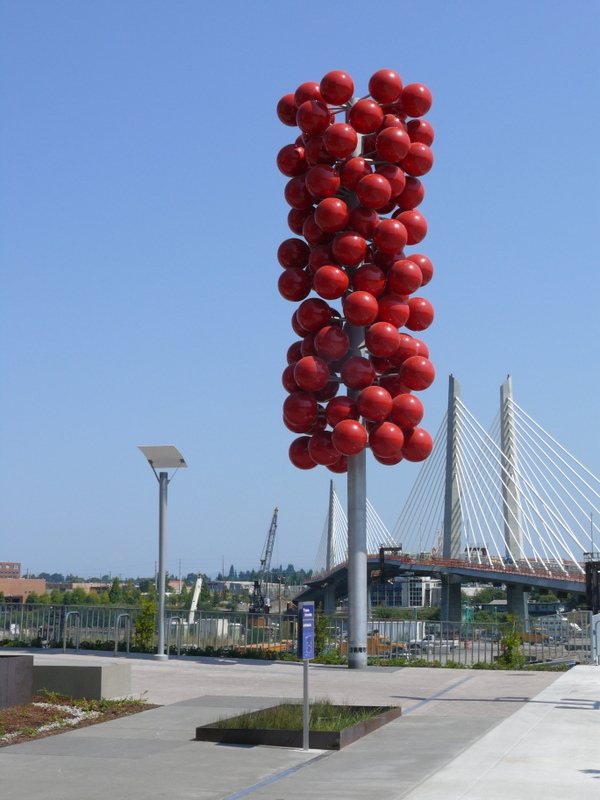 Those colored conical caps on the pilings at the marina seem to be a Portland thing, as the vast majority of pilings in this part of the river seem to get this treatment. I’m told that they’re so tall to accommodate fluctuating water levels and pointed to discourage birds from roosting although it seems to me you’d rather have birds roosting on those pilings than on your boat. Here’s a shot of most of it, from the south. The lift portion, also from the south. Here’s the western entrance. Note the wonderfully generous sidewalk/bicycle lanes. 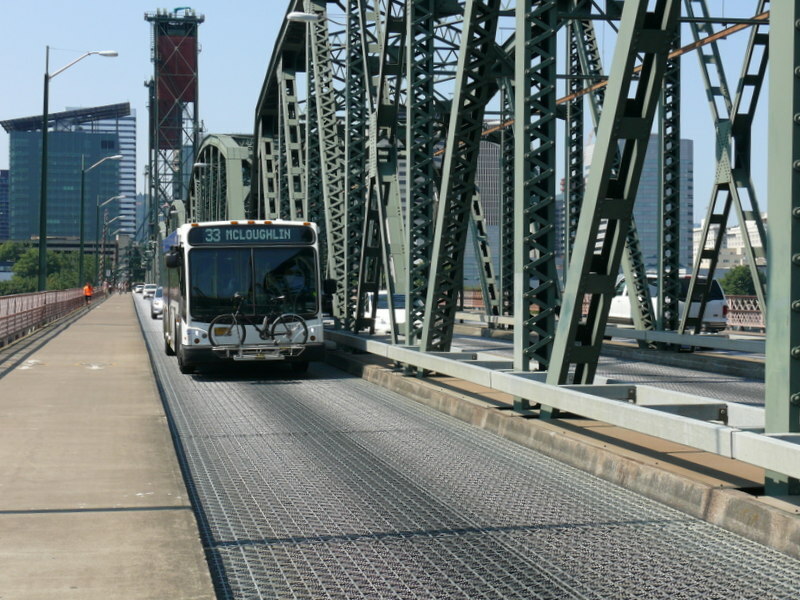 No, this is not intended to be a shot of one of Portland’s buses but rather of the roadbed of the bridge. Yes, that’s a steel grid like the one on the old Covington bridge across the Ohio from Cincinnati when i lived there in 1970. Between rains, road grime accumulates on them, and then when the first sprinkle in a while arrives, they become slick as greased glass. I used to ride over that one in Covington on my motorcycle, which was an utterly unnerving experience not only because you were instantly aware of how little it would take to make you lose control of the cycle but also for the mental image of your downed body being mashed through the grid by the following bus so that you rained into the river as a thousand delectations for the carp. Bless Portland. Here, the bikes get to ride on that wide concrete pathway to the left of the bus. Here’s the tender cabin. Note that it’s occupied! Not that the lazy swine would deign to open the bridge while i could photograph it. Oh no. One last shot, this one from the east bank. 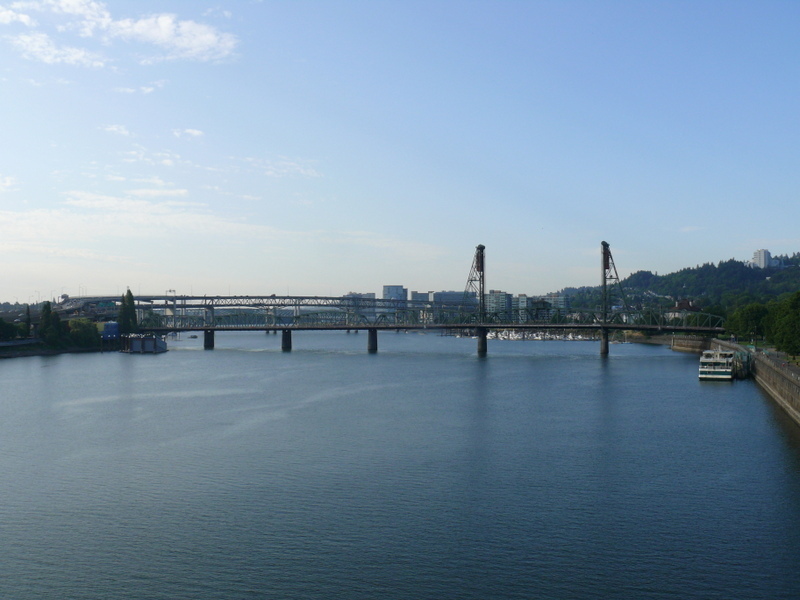 I lied, here’s the last shot, taken in the morning from atop the Morrison Bridge That’s the Marquam Bridge with tiny pieces of the Tilikum Crossing behind it in the background. 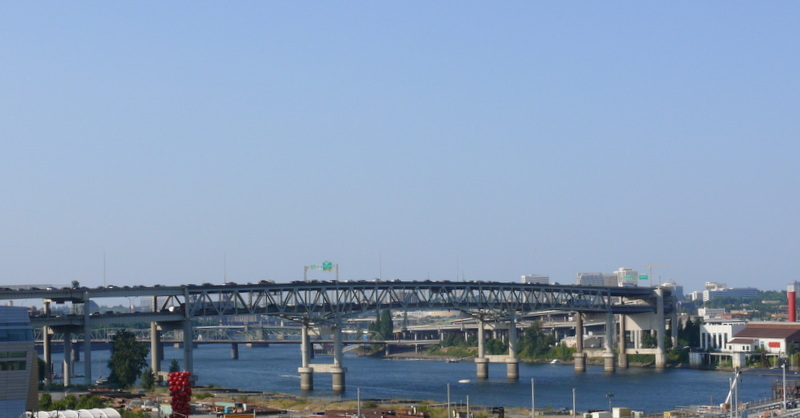 OK, maybe too many photos of the Hawthorne Bridge, but this is my favorite bridge so far. 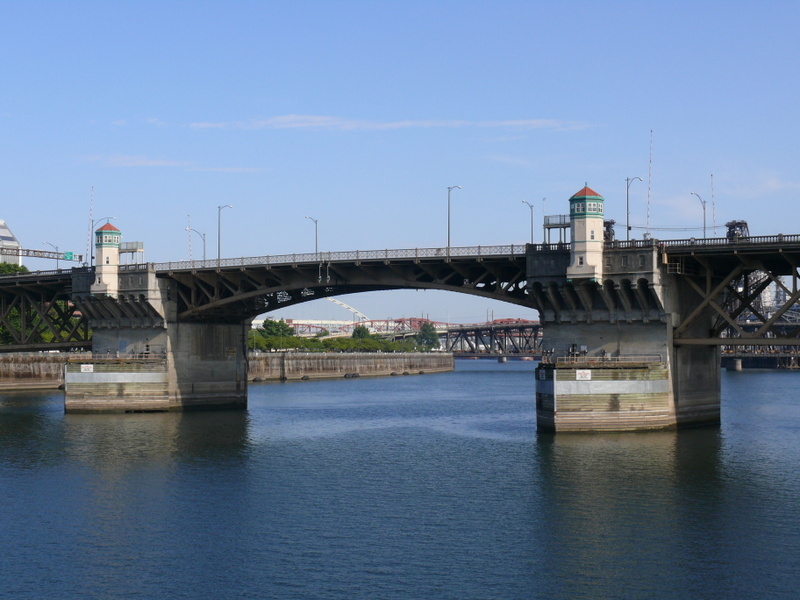 The next bridge northwards, a mere four-tenths of a mile, is the Morrison Bridge, a double leaf bascule bridge dating from 1958. Here’s the double bascule and tender towers. One of its best features is a wide bike pathway and raised sidewalk, both separated from the vehicular traffic by a barrier. And don’tcha just love those fifties-style tender towers. 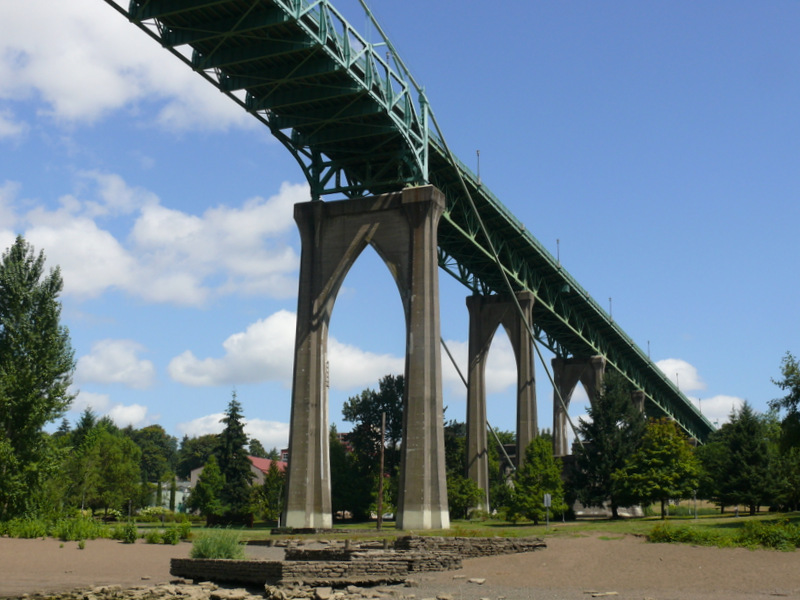 How do you get down off the bridge onto the Willamette River Waterfront park on the east side? Easy. And once you twirl down to the park, here’s the bridge from under the spiral bike ramp. And from the north side. 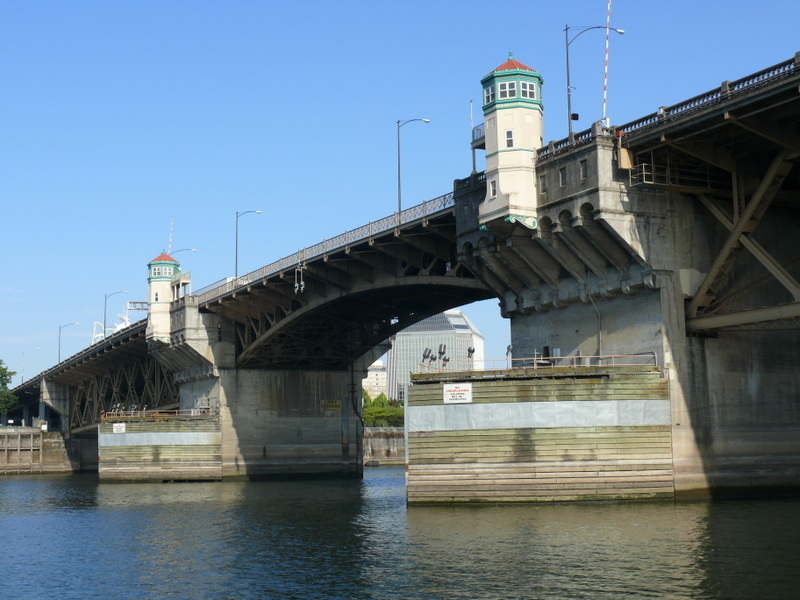 So much for the Morrison Bridge. 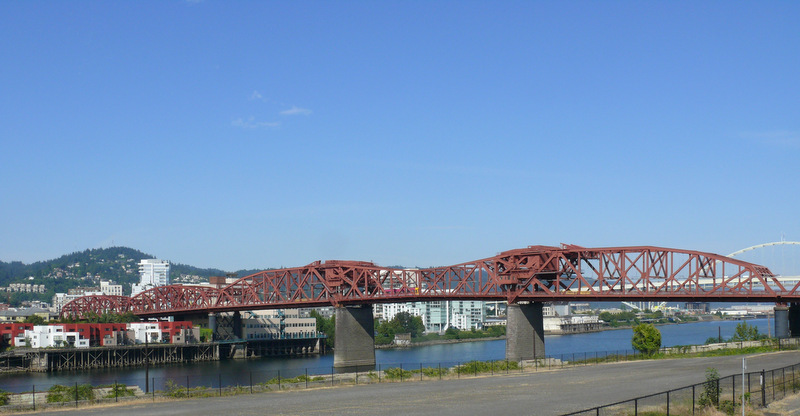 Now let’s look another four-tenths of a mile to the north to see the Burnside Bridge, built in 1926 and another double leaf bascule bridge. 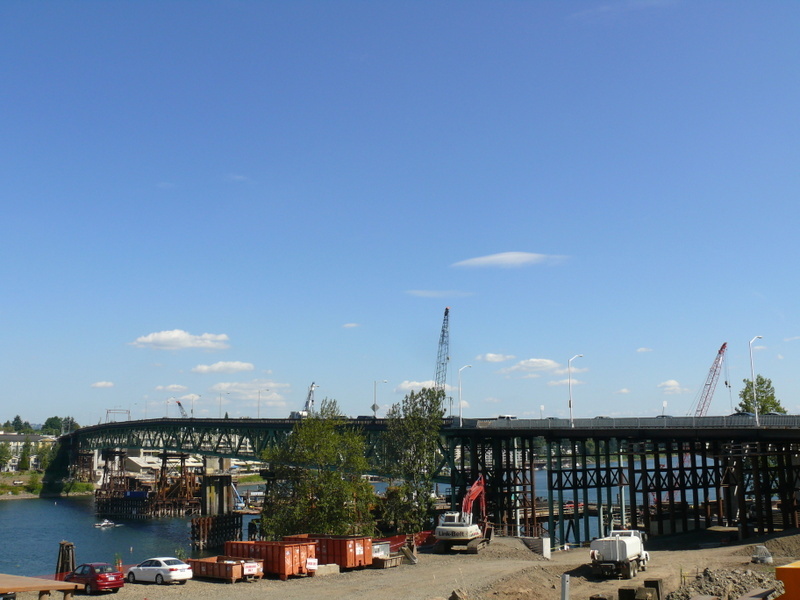 Here it is as seen from the Morrison Bridge. 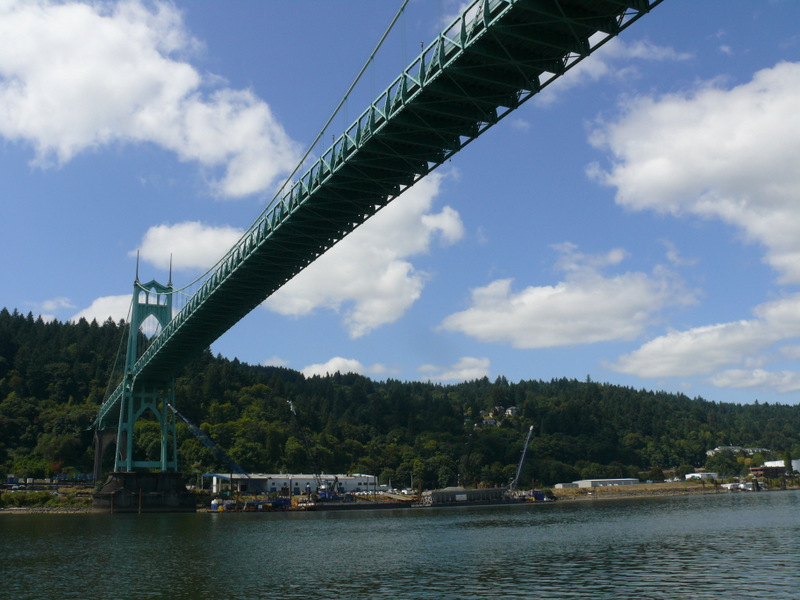 That’s the towers of the Steel Bridge behind it. A closer view, focused on the bascule portion and tender towers. 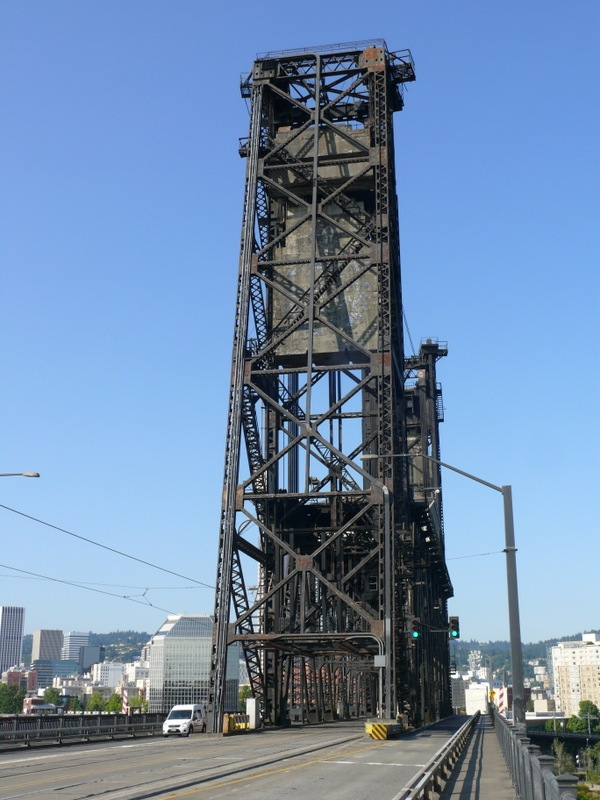 Just a third of a mile north is the Steel Bridge, completed in 1912 and looking at a casual glance, since it also has a vertical lift bascule, much like the 1910 Hawthorne Bridge. It’s much, much different. 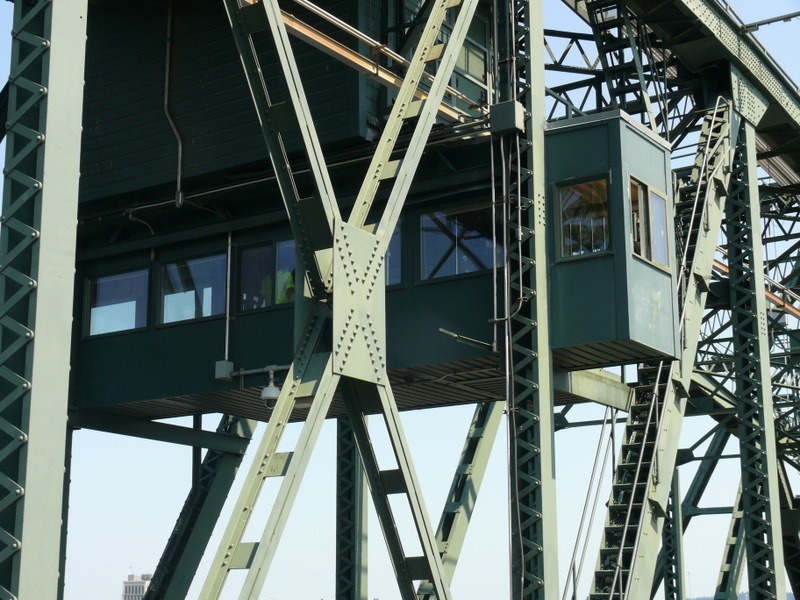 In the first place, it has two decks, and in a marvel of early twentieth-century engineering the lower deck bascule can telescope up against the bottom of the upper deck bascule to allow smaller boats to pass. For larger boats, both bascules are cranked up on the towers. Yow! Owing to neglecting to do my homework before i ran around photographing these bridges, i was unaware of the uniqueness of the Steel Bridge and did not take enough photos to properly document it. Anyhow, here it is from the Burnside Bridge. And a closeup of the bascule portion. If you look closely at the left tower you can see two counterweights. The smaller one to the left and above the big one is to lift the lower bascule alone. The large one lifts both bascules. Another four-tenths of a mile north (are we seeing a pattern here?) lies the Broadway Bridge, dating from 1913 and another double leaf bascule bridge, of which i found a fascinating link illustrating the mechanics and also including much better photos of the bridge than mine. 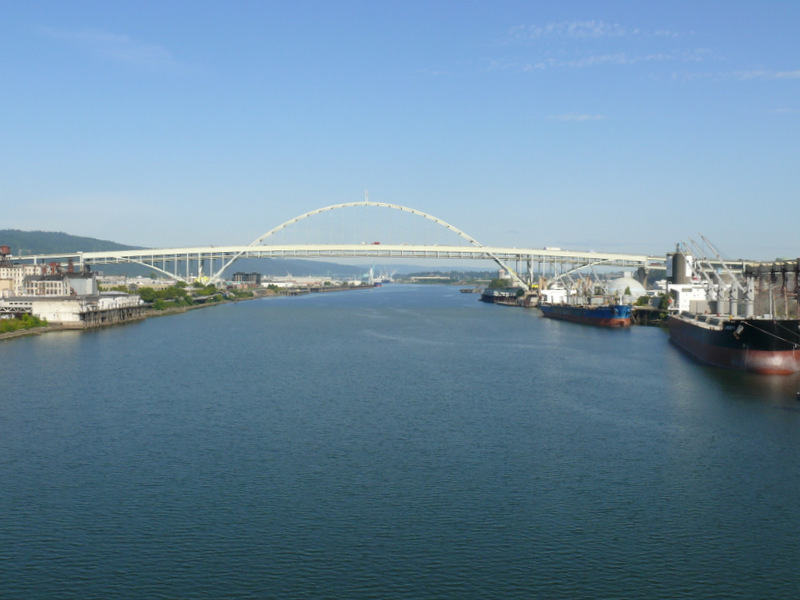 Here it is as seen from the Steel Bridge with the arch of the Fremont Bridge in the background. 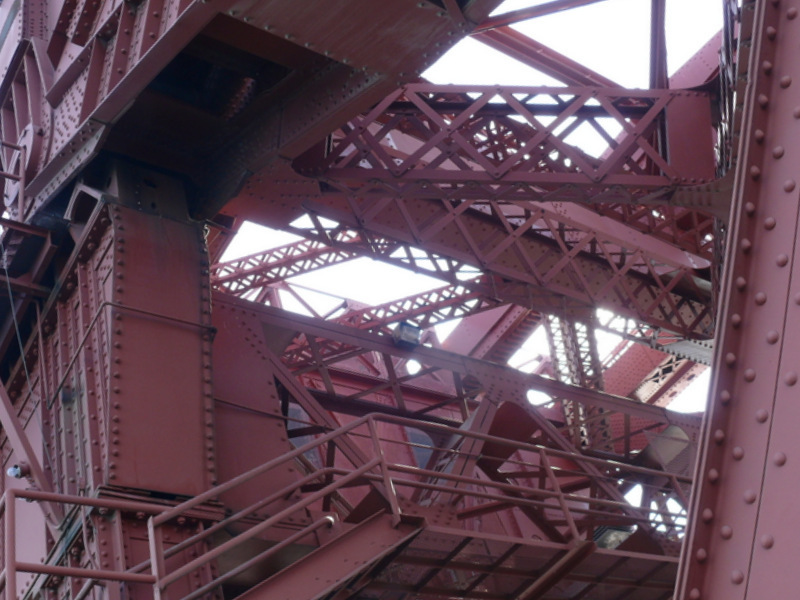 And of course a closeup of the bascule portion. A shot from the east bank. Hampered by my deficiencies in aesthetics, I was trying to understand why i find this bridge so handsome, and finally decided that no, it was not that they’d painted it International Orange, our Golden Gate Bridge color, but rather because the low arches of the support structures of the fixed span portions are broken by the swoop of the support structure for the bascules. Well, that and that in the Rall bascule bridges none of the mechanism rises above the rest of the structure but yet it’s visible through the steel framework. 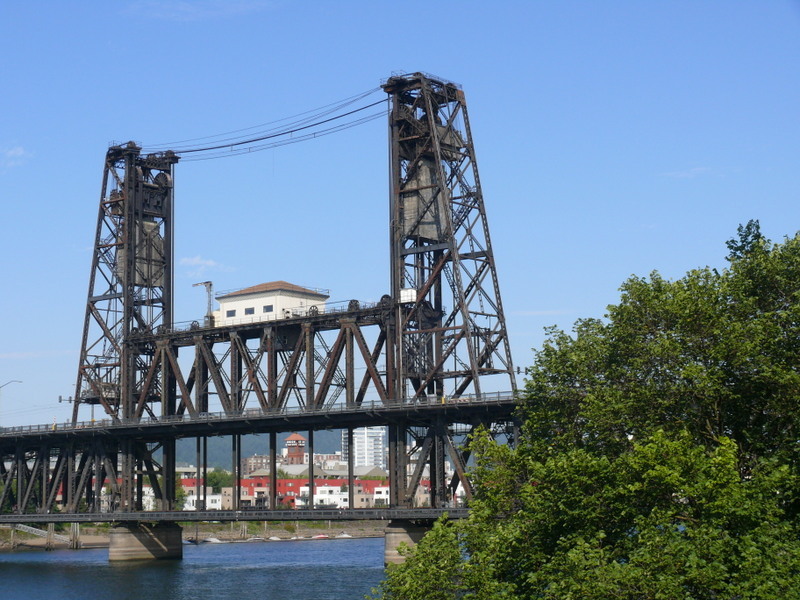 The famed engineer Joseph Strauss built quite a number of bascule bridges, and IMHO they are all interesting and functional mechanically but hideous aesthetically, with massive mechanical structures rising high above the bridge itself. Not so here. Looking into the maw from the east side. You know how i am with arty shots of pieces of things, so here’s my pitiful attempt at showing the intricate bascule mechanism. So much for closeups. Here’s another try although you just can’t see the mechanism from the bridge. In reality, the only vantage to get a shot that gave any insight into the mechanism would be to have myself dangled from a helicopter by a long rope. Ummmm, maybe a steel cable. What went completely unphotographed is that as i was Segwaying across in the generous bike lane i encountered a couple of bridge workers. The good news is that one of them was very interested in the Segway and got his trial ride. The bad news is that i didn’t have the sense to ask him when might be a good time to catch the bridge in operation. Sigh. 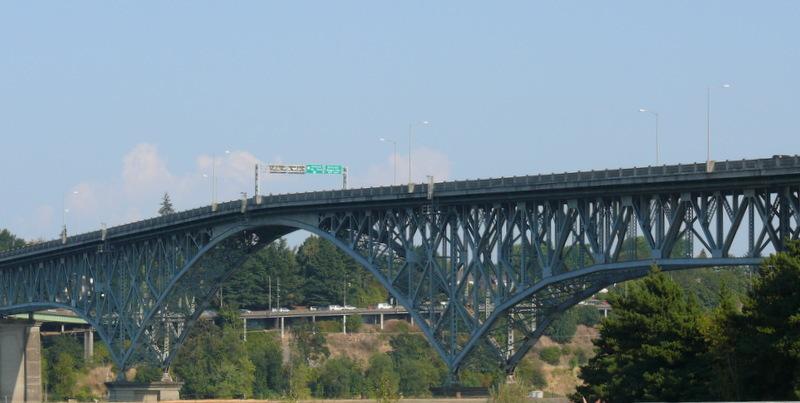 The next bridge, six-tenths of a mile to the north, is the enormous Fremont Bridge, built in 1973 and carrying I-405. Here it is from the Broadway Bridge. And a closeup of the arch. As much as i love the old bridges i’ve covered so far, this one is to me by far the most beautiful. Note that i exclude Tilikum Crossing, as i think it’s equally beautiful although on a much smaller scale and so new that it isn’t open yet. 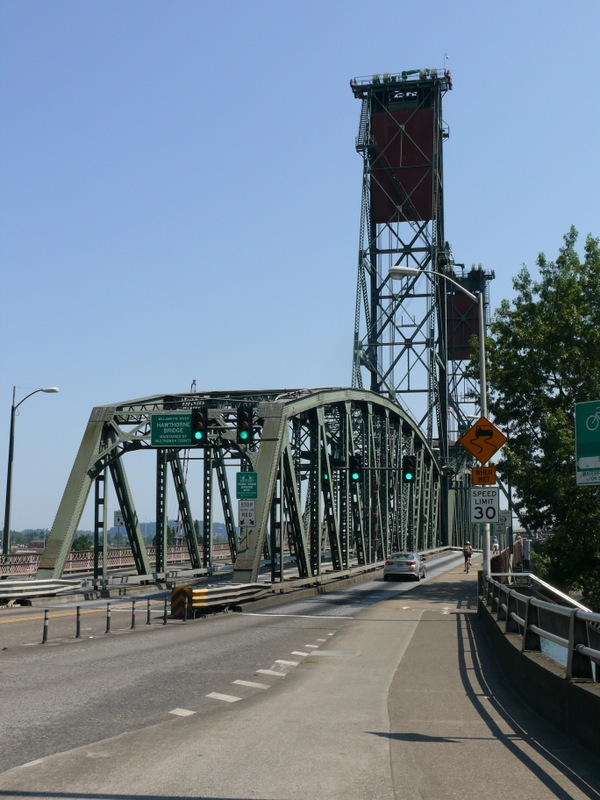 The rest of the story about the Fremont Bridge is that as i was planning to make an excursion to it so that i might photograph it more closely and ride over it, i discovered that it is open to bikes/pedestrians/Segways only one day a year, for Portland’s famous Bridge Pedal. I was crushed, and i’d been pushing myself to my limit for the past few days and was getting tired. 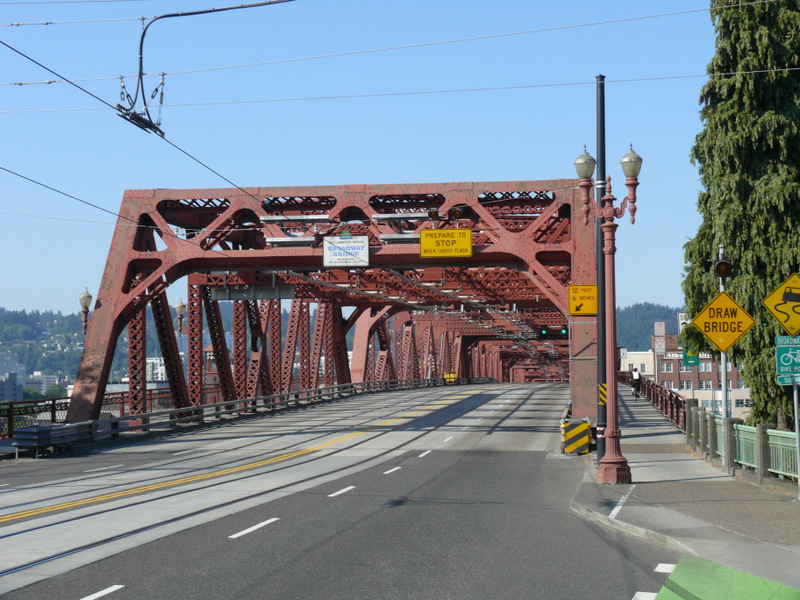 So i rested that afternoon, somehow forgetting that i could at least ride up close to the Fremont Bridge and get more photos. So there aren’t any more of it from me although you can go to that link above and look at the images in the gallery. 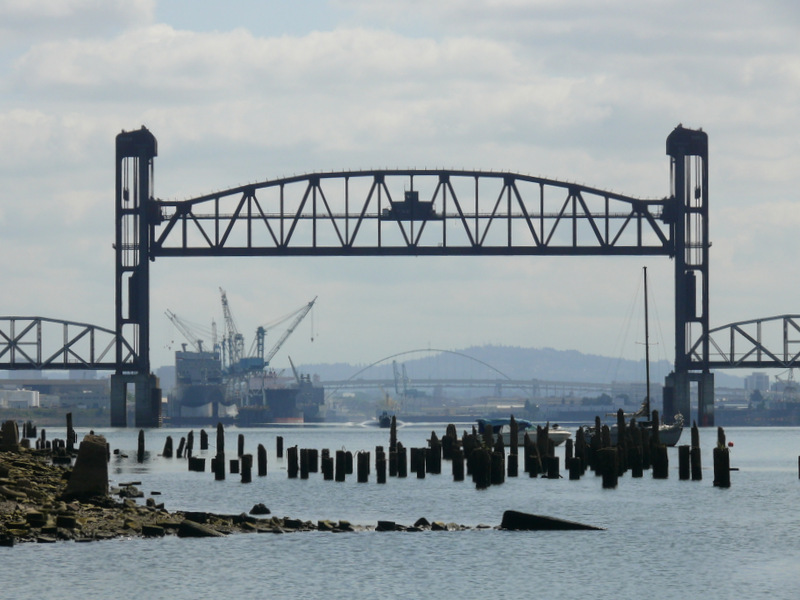 Next, 4.1 miles north, is the Burlington Northern Railroad Bridge 5.1 , and that is not a misprint. 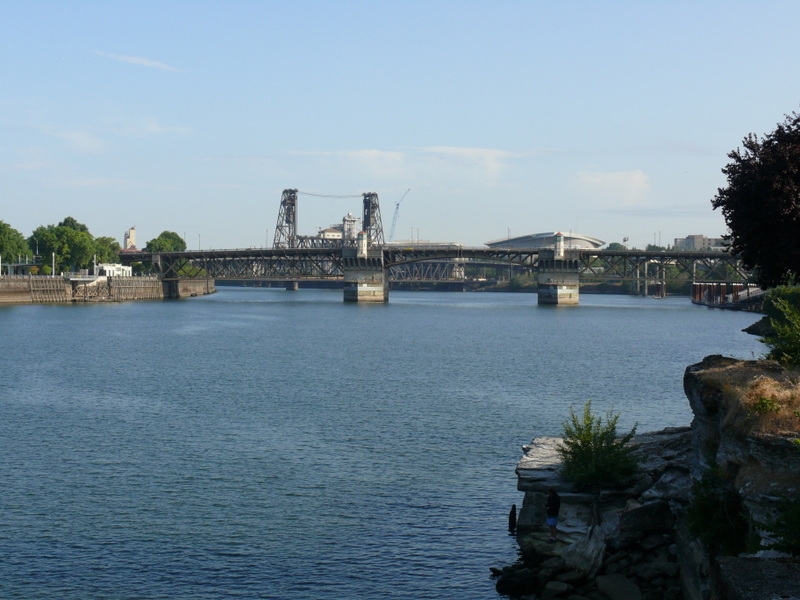 Its proper name includes the “5.1”, a reference to its distance from the Portland Union Station. 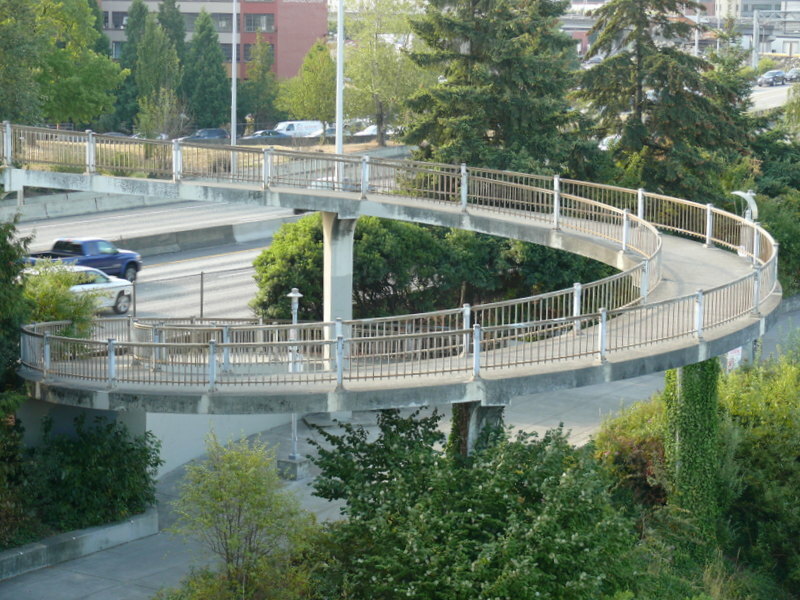 This is an interesting bridge for several reasons, starting with its being a railroad-only bridge with no access for other vehicles, bikes, or pedestrians. Also, it’s not on my maps, so i didn’t know of its existence until i’d gone up to photograph the St. John’s Bridge and spotted it. I wrote a blog post about it, calling it the “Secret Bridge” since neither of the two locals i talked with knew its name, both saying they just called it “the railroad bridge”. But it gets even better. 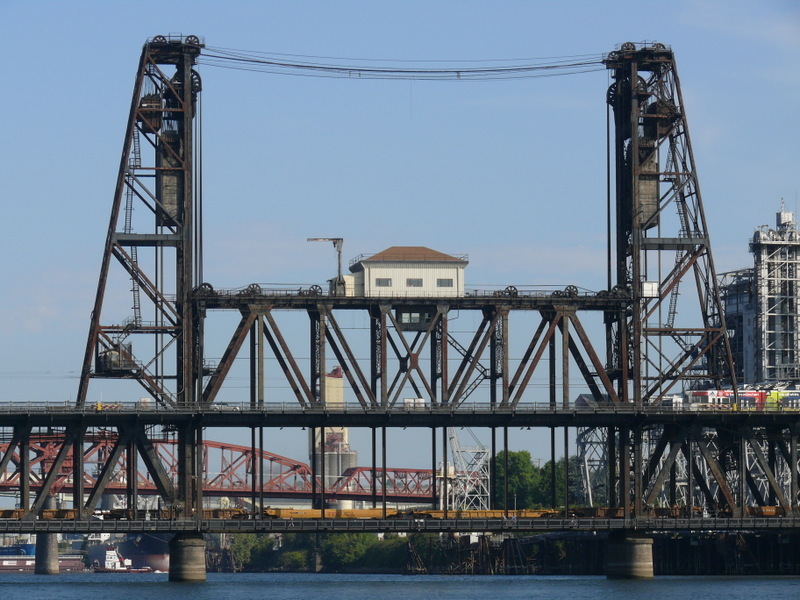 When i first spotted it, i did a double take and realized that it was open, the only Portland drawbridge that i managed to catch open. Here it is two-thirds open. And fully closed from the St. John’s Bridge. 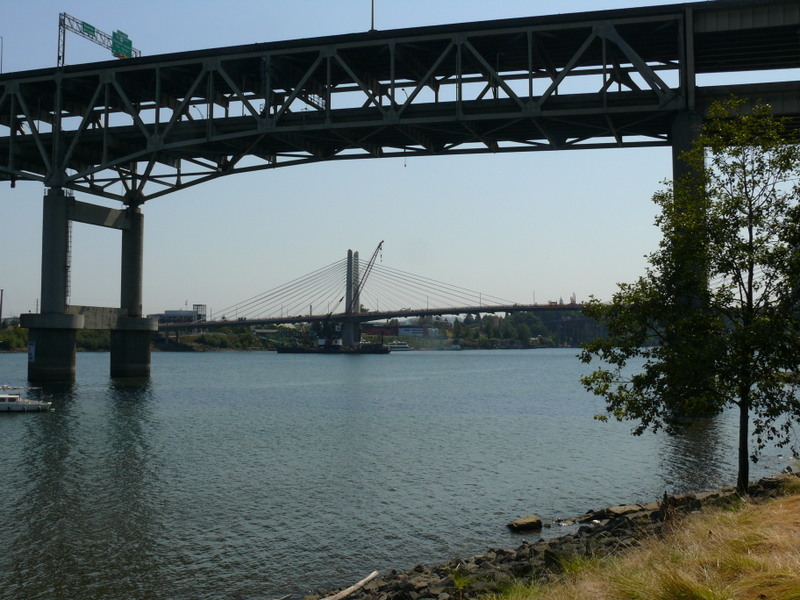 This bridge and the Tilikum Crossing were wonderful bonuses since they weren’t on my maps and i just blundered onto them. 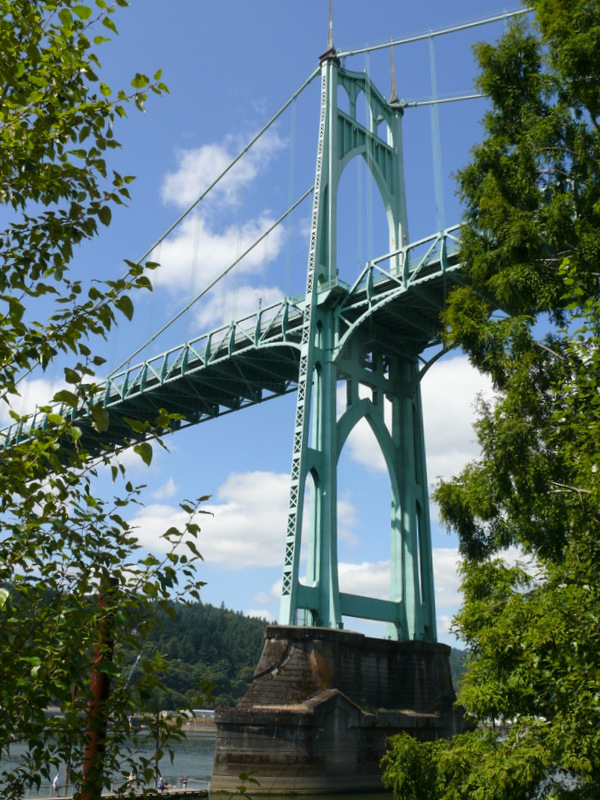 Just 1.2 miles to the north is the St. John’s Bridge from 1931, the northernmost bridge over the Willamette and one of the loveliest. From the east bank. A closeup underneath from the north side. From the bike path as i begin the crossing. And finally, from the west end as i returned. 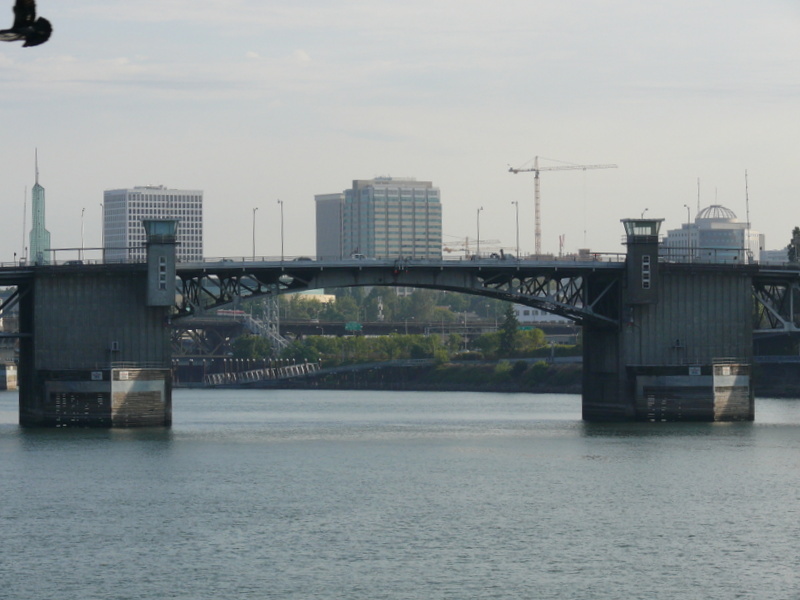 That’s it for the bridges over the Willamette in Portland. 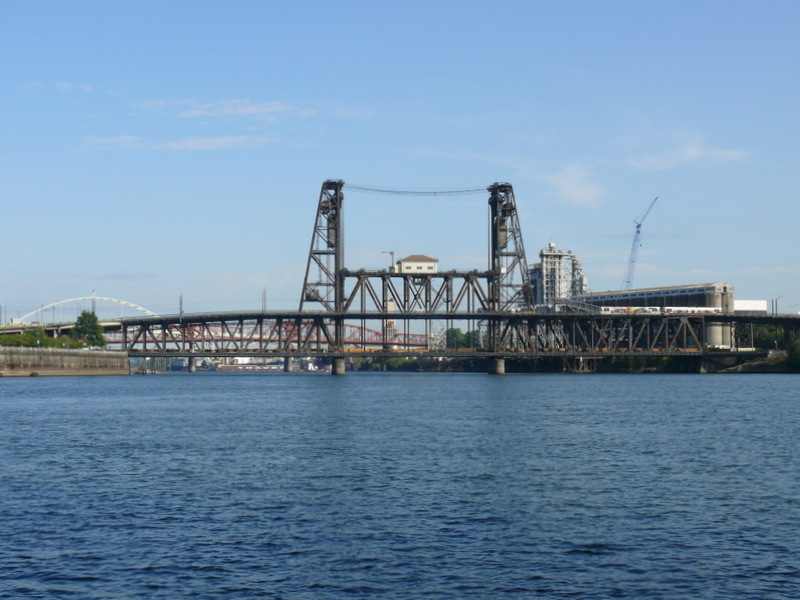 Here’s an excellent link detailing all the Willamette River crossings. And now, a drumroll please, the last bridge. Well, actually, a set. 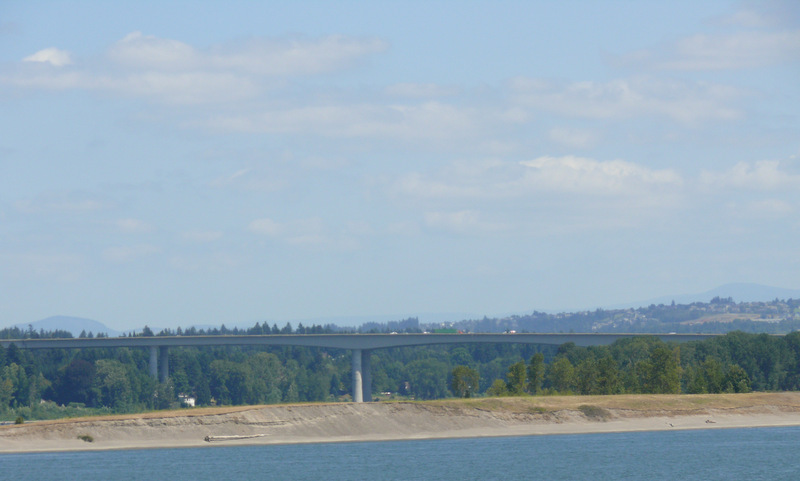 Since i’d hauled the Segway up to the St. John’s Bridge in the Prius, i went ahead and drove on up a bit farther north to the Columbia in expectation of finding vantages from which i could photograph the I-5 and I-205 bridges over it. 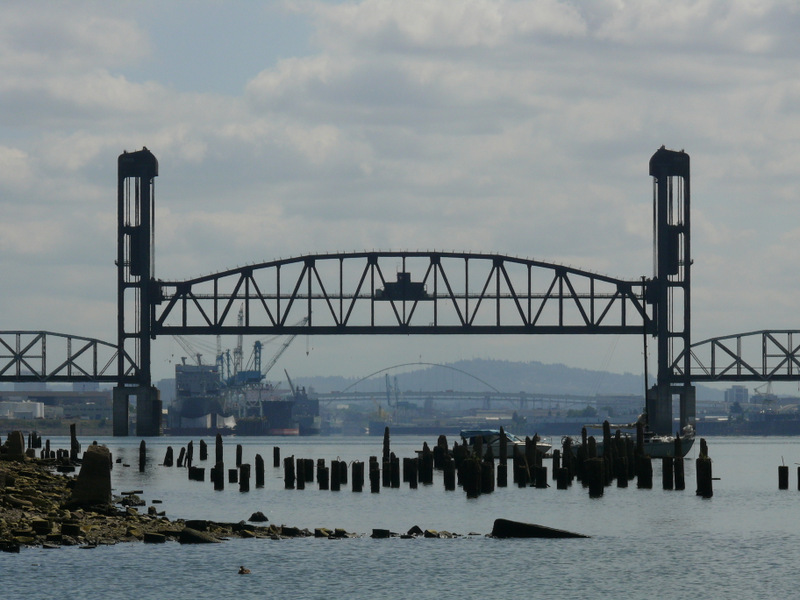 I disappointed when i drove along N. Marine Dr. and got to a point where i could see the I-5 bridge, only to find it utterly uninteresting. And then i was crushed when i drove five miles east and could see the even less attractive I-205 bridge, but what i’d failed to notice is the I-5 passes over a small, shallow portion of the Columbia to an island before you get to the real I-5 bridge, which i didn’t discover until the next day when i was headed up to Mt. 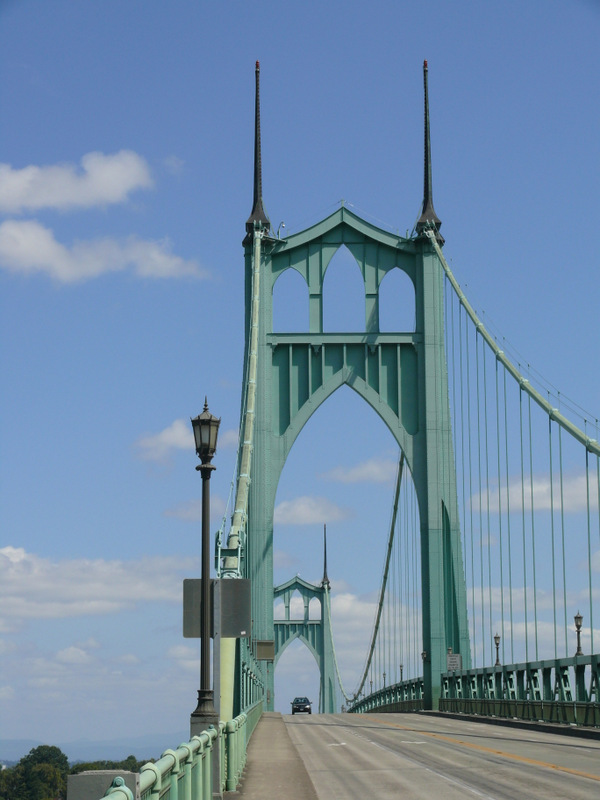 St. Helens and crossed the Interstate Bridge in shock. Not such great shock that i couldn’t take the first exit in Washington and run along the river to get some pics of this 1917 delight. The whole thing. And the vertical lift bascule portion. And that’s it. 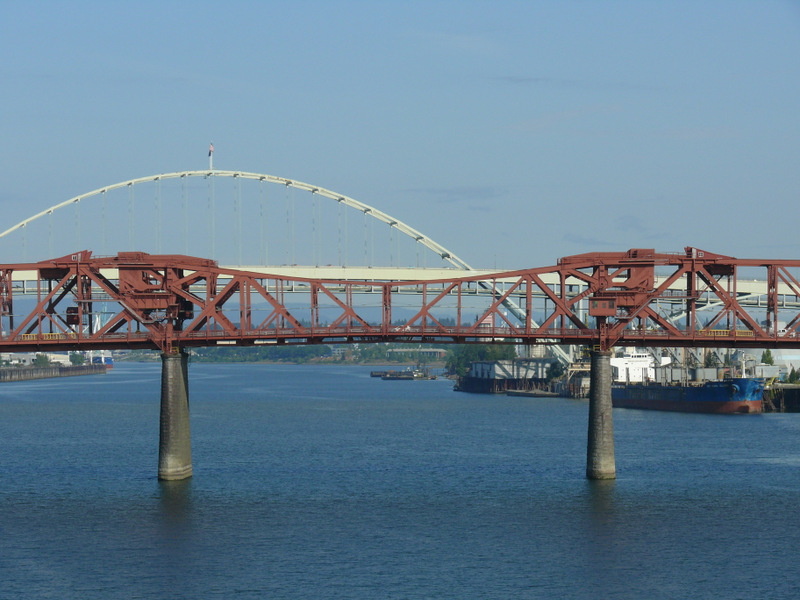 All of Portland’s bridges. 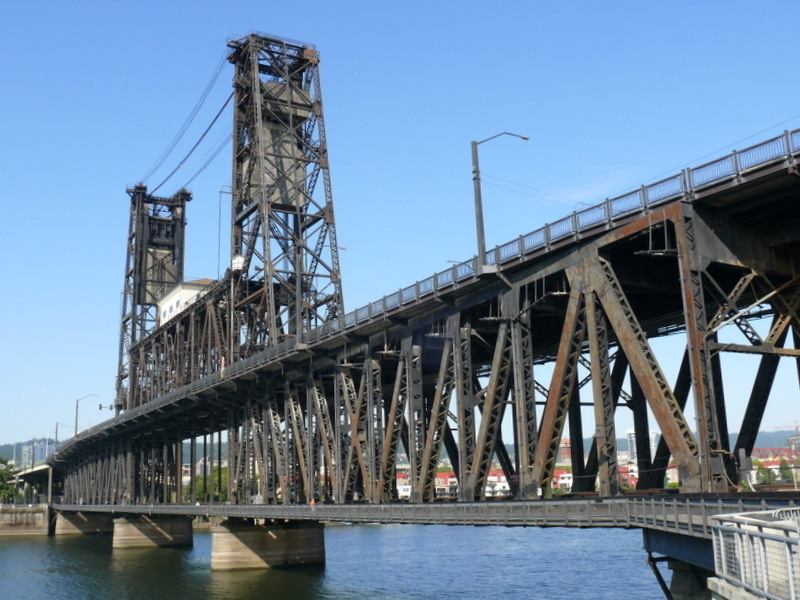 In my coverage of the Fremont Bridge i mentioned Portland’s famous Bridge Pedal and included the pitiful link that i’ve reproduced here, not because it’s good coverage of this spectacular event but rather because, as best i can tell, there is no good coverage of the event. The most informative link i could find was this map of the route of the 2014 event. 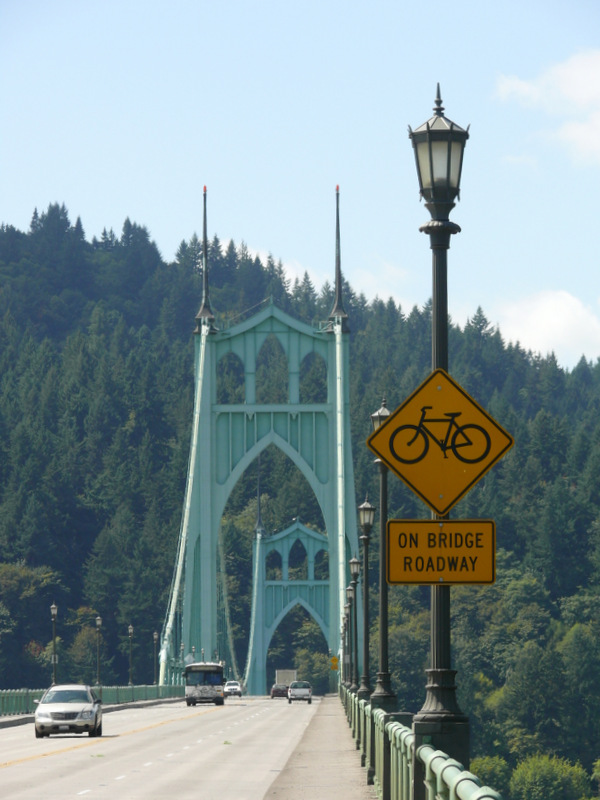 I learned about the Bridge Pedal from my avid bicyclist friend Peter in June and realized that that weekend would be the ideal time for me to make my Portland bridge expedition. Silly boy. 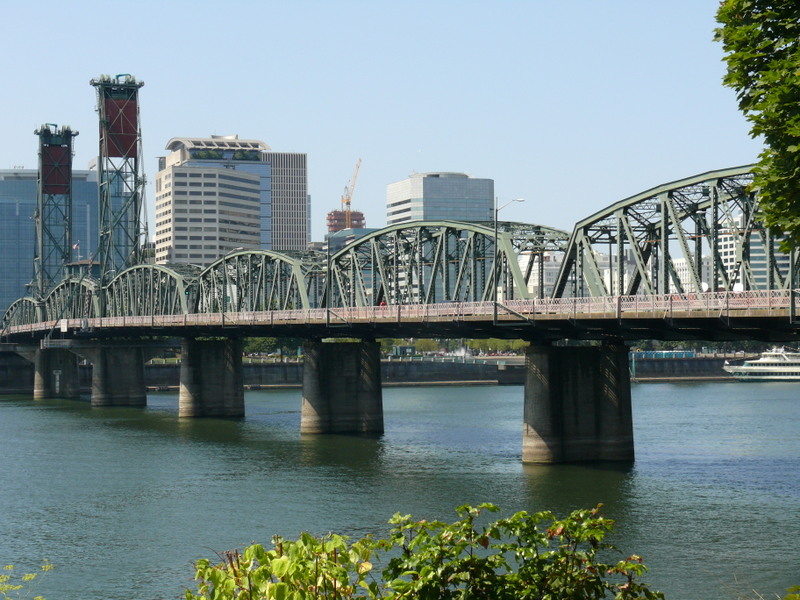 I looked at a couple dozen hotels in downtown Portland, and all were booked solid this year for several days on either side of Bridge Pedal. So i mounted the expedition two weeks later. 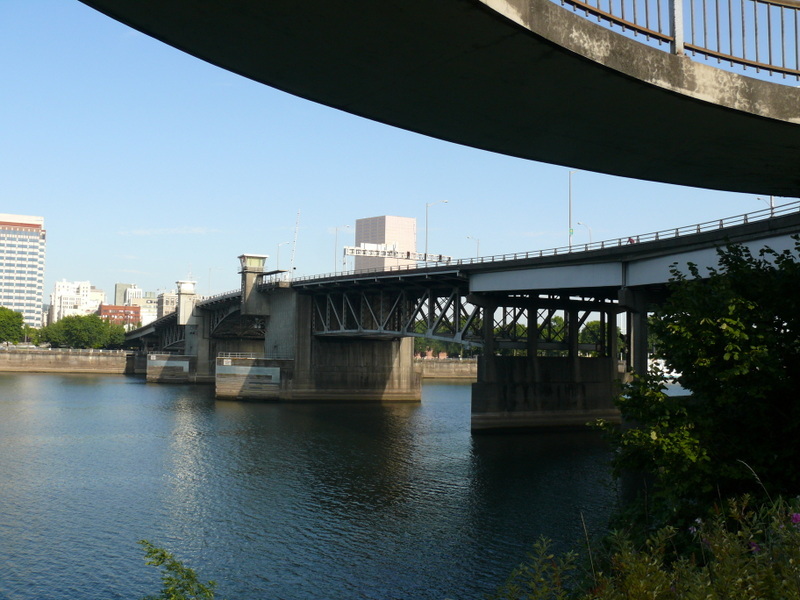 Now i’m realizing that i need to ride over the Fremont Bridge and Tilikum Crossing, and i’d quite like riding over the Marquam Bridge during the Bike Pedal. 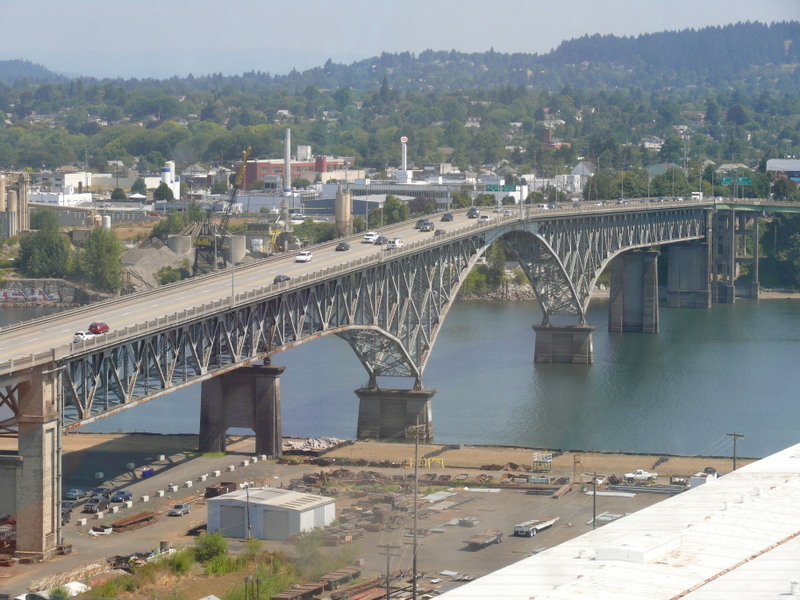 Not only that, but i also need better photos of all the bridges, most particularly the Fremont Bridge, so i’ve booked a room at the excellent University Place Hotel for the twentieth anniversary of the Bridge Pedal next year (August 9, 2015), and since it will include the new Tilikum Crossing, there’ll be eleven bridges on the full ride rather than the ten it’s traditionally covered. And on my return to San Francisco i could just work my way up the Willamette photographing its bridges all the way down to Springfield, 185 miles south of its mouth at the Columbia. I can dream, can’t i? Many thanks for a too generous comment. What I always love is that when I look at your photos I will never look at a bridge in the same way again. Now that is the sign of a great artist who can evoke that in the viewer. Oh damn, you’re way too generous. I’m nowhere near that good, but i sure do enjoy exploring and photographing bridges and of course tickled pink someone likes the stuff. It’s true, I have a whole different perspective on bridges and their beauty! I didn’t even know Portland had an aerial tram — it’ll be on my next “Things I Must Do in Portland.” Your photos of St. John’s Bridge are awesome because you’ve made it look like the facade of some European cathedral, except with it being the entrance to the sky — a better intention than those European cathedrals which help one get closer to imaginary friends. 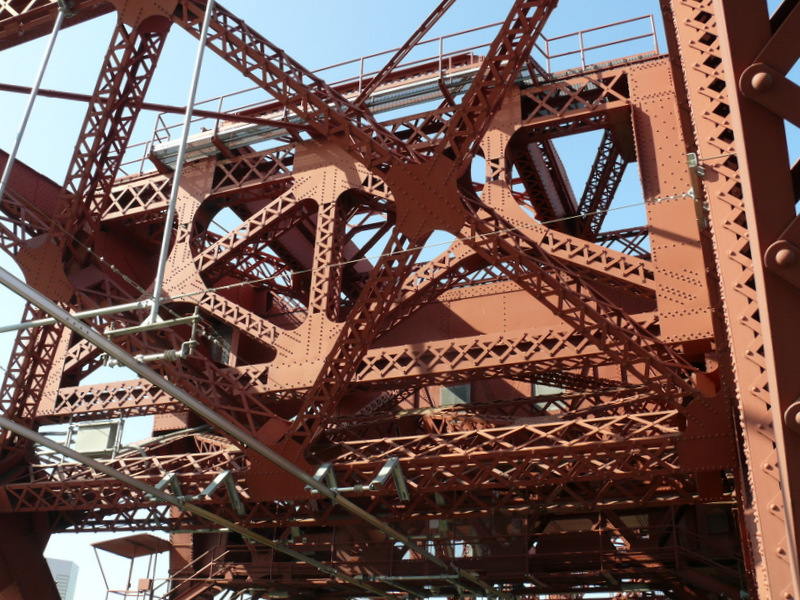 And the close-ups of the Broadway Bridge! No matter your self-criticism, your photos made art from the mechanical construct which is art in itself. Beautiful collection! You’ll turn my head with such praise. 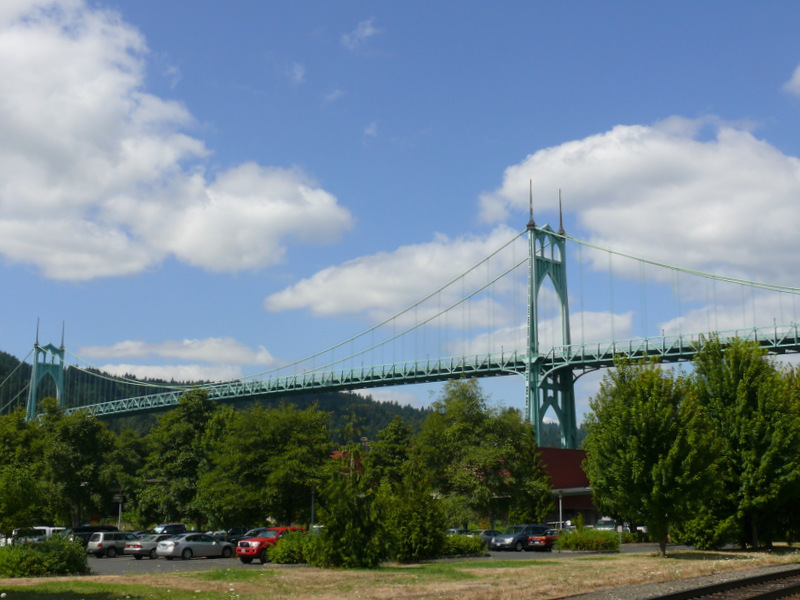 The good news is that next month i’ll be going back to Portland to ride in the Bridge Pedal and hopefully take more and better photos with my new camera. Stay tuned.